Wales is a wondrous and warm place to be. Warm should not be taken very literally here though. It was early April morning and I flew in from Bristol, arriving in the midst of heavy spring showers, the plane touching ground when it had barely come out of the thick and grey clouds. I didn’t dare to look at my companions’ faces and was a bit worried myself that these clouds were going to accompany us throughout the whole journey. We had planned for a road trip and on the list were mountains, coasts and cities. And even though somewhat expected, we were still quite overwhelmed by the natural beauty of this magnificent country. As soon as we had crossed the Severn bridge, the rain stopped. We drove all the way up North, passing through Abergavenny and Llandrindod Wells in the county of Powys. Slowly getting used to sitting in the wrong site of the rental car and driving on the wrong side of the street, we were glad to arrive in Snowdonia without any major incidents and were even delighted to see the sun come out. Our starting point to explore Snowdonia National Park was Betws-y-Coed, a charming Victorian town set in woodland and mountains. 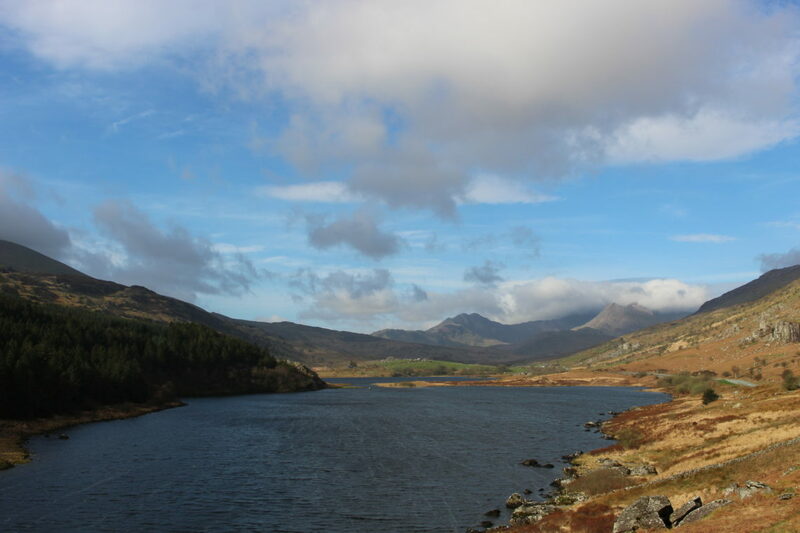 From there we embarked on a scenic route around the area, with stunning views on lake Llyn Gwynant. Trees were still without leaves but daffodils were already popping up everywhere. In Llanberis we took the Snowdon Mountain Railway which brought us to Snowdon’s peak, comfortably and easy. It’s a fantastic way for the ‘less energetic’ to get to the top and have a marvellous view of the spectacular countryside with its fifty shades of green. I took a million pictures from every angle during those 30 minutes we spent on the summit. We left Snowdonia and headed further North to the coastal towns of Llandudno and Beaumaris. Llandudno is a seaside classic with a superb seafront and a traditional seaside pier, dating from the late 1800s. Although quite chilly in early April, we took a stroll along Wales’ largest pier. It’s a great attraction but it left me somewhat disappointed to find an Arcade at the end of it. Let’s just say I’m not a fan. We left the mainland of Wales, driving up the Menai Bridge into the county of Anglesey straight into the town with the longest name. The name was invented by way of publicity stunt to attract attention. Besides the famous train station with the multi-photograhped name and a Visitor Center with Welsh handicrafts there isn’t that much to be seen or done. Much more interesting is Beaumaris, a picturesque little town situated near the mouths of the Menai Strait. You can walk through the village in less than an hour but all the historic buildings will constantly draw your gaze from left to right. The real masterpiece is Beaumaris Castle, the last and largest of the castles to be built by King Edward I to conquer the north of Wales. It looks stunning from the outside, set in the middle of perfectly trimmed green lawns and overlooking the sea. Technically quite difficult, it was a very ambitious and expensieve project and some parts were never finished, due to lack of funds. Sounds familiar to me ! We continued our drive heading south west alongside Cardigan Bay, which is dotted with lovely seaside towns like Aberystwyth and Aberaeron. We took halt in Newport, not the third biggest city of Wales but the tiny coastal village in Pembrokeshire. It’s a magical place, a hidden treasure although it seems I’m not the only one who has spotted this gem when I count all the holiday cottages. Most of them are still empty though at this time of the year. There is only one thing to do in Newport and that is to leave your car behind and start walking the Wales Coastal path, 870 mile long and uninterrupted route along a national coast. The path offers spectacular views of beaches, estuaries, woodlands, and very steep cliffs. I’m still in doubt whether to call our walk terrific or terrifying. If you’re not afraid of heights and don’t mind getting soaked this is surely one of the greatest walks you can imagine. After so much natural beauty it was somewhat disappointing to arrive in Swansea, the second biggest city of Wales. Fortunately Brecon Beacons National Park was not too far away. The weather conditions being excellent, we dipped into the outdoors again. We set off for an epic walk from Pont ar Daf carpark to the Pen y Fan summit and enjoyed the greatest views of the rolling hills and ridges. Our visit to Wales has been quite extraordinary: without actually planning to we ended up visiting all 3 National Parks. We enjoyed a fair bit of superb walking and a fair amount of sunshine. Clearly the best things in life are for free !